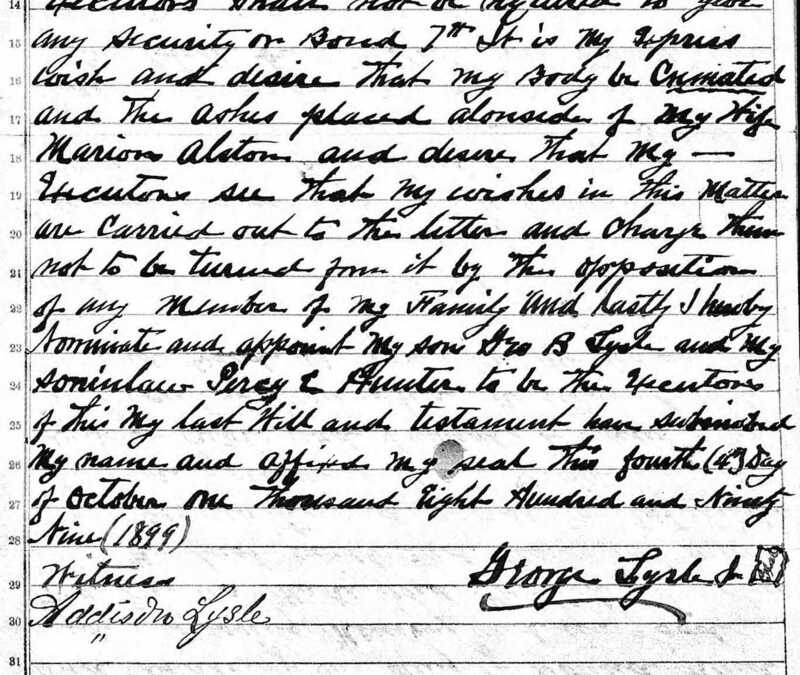 While writing about my great-grandmother, Marguerite Lysle last week, I realized that I had not written much about her father, George Lysle, Jr.
For this week's 52 Ancestors in 52 Weeks writing challenge from blogger Amy Crow Johnson of No Story Too Small, the theme is "Unusual" and if you read through, you'll find a somewhat unusual request made in the will of my second great-grandfather, George Lysle, Jr. He was born in Allegheny City, Pennsylvania, on the last day of February 1845, the youngest son and second-to-youngest child of George Lysle and Margaret McIlwaine. He lived his entire life in Allegheny or Pittsburgh working as a coal merchant. He married Marion Helen Alston on October 13, 1875. See their beautiful wedding invitation. Their two children were Marguerite and George Barton. Sadly, Marion died in 1885. He is mentioned in my Surname Saturday ~ Lysle of Pennsylvania post. I have shared his family's 1880 census record. I also have shared newspapers notices of his civic participation on a local school board and a brief death notice. On June 11, 1889, George, age 44, married Edith O. Hadly, less than half his age at 20. June 13, 1889, page 5, column 2. George Lysle-Edith Hadly wedding. http://www.newspapers.com/image/86437291/, Pittsburgh Daily Post, Pittsburgh, Pennsylvania, online images (http://www.newspapers.com). Miss Edith O. Hadly, both of Allegheny. That summer, Marguerite turned 13 years old and George Barton turned 11. As I have noted before, Marguerite never spoke about her step-mother. According to the printed Lysle family tree that I have, George fathered two children with his second wife: Charles Hadly Lysle and James Wilson Lysle. 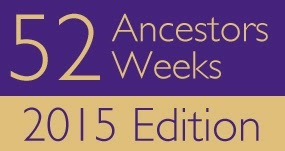 The only record I show of James is that he is on the Lysle family tree; he must have been born and died in the 1890s. I have found additional information about Charles, who did marry but had no children. He died of "apoplexy" on May 23, 1900, at his home, 4223 Fifth Avenue, Pittsburgh, at the age of 55. The following obituary gives a little bit of information about the last few weeks of his life. May 21, 1900, page 2, column 2. George Lysle Jr. obituary. http://www.newspapers.com/image/86435944, Pittsburgh Daily Post, Pittsburgh, Pennsylvania, online images (http://www.newspapers.com). 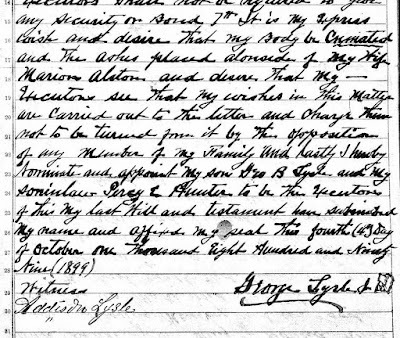 Ancestry.com has recently made many wills and probate records available and I was able to find the Pennsylvania probate file for George Lysle, Jr. He left $10,000 to his son George B. Lysle "for and on account of the assistance and comfort that he has given me in my Business in the past three years." Probate Place: Allegheny, Pennsylvania; Will Packets, Vol. 62; Case Number: 207. 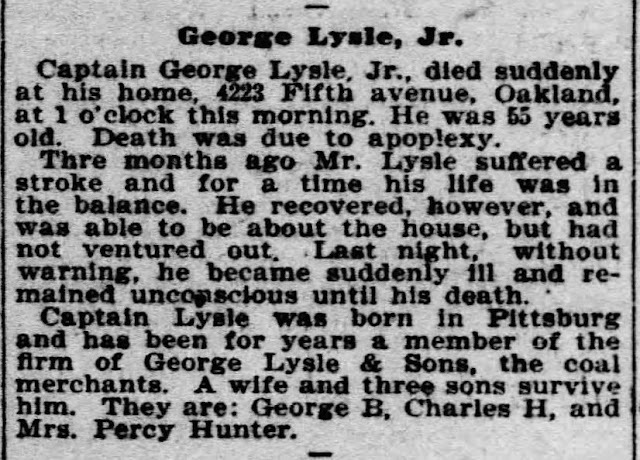 Record for George Lysle Jr.; Probate Date: 26 May 1900. 7th It is my express wish and desire that my body be cremated and the ashes placed alonside [sic] of my wife Marion Alston and desire that my Executors see that my wishes in this matter are carried out to the letter and charge them not to be turned from it by the opposition of any member of my family and lastly I hereby nominate and appoint my son Geo B. Lysle and my soninlaw [sic] Percy E. Hunter to be the executors of this my last will and testament [I] have subscribed my name and affixed my seal this fourth (4th) Day of October one thousand Eight Hundred and Ninety Nine (1899). Note that cremation was not very common at this time; the first crematory in the United States had been built in 1876. This request was likely controversial and George probably had family members who disagreed with it. 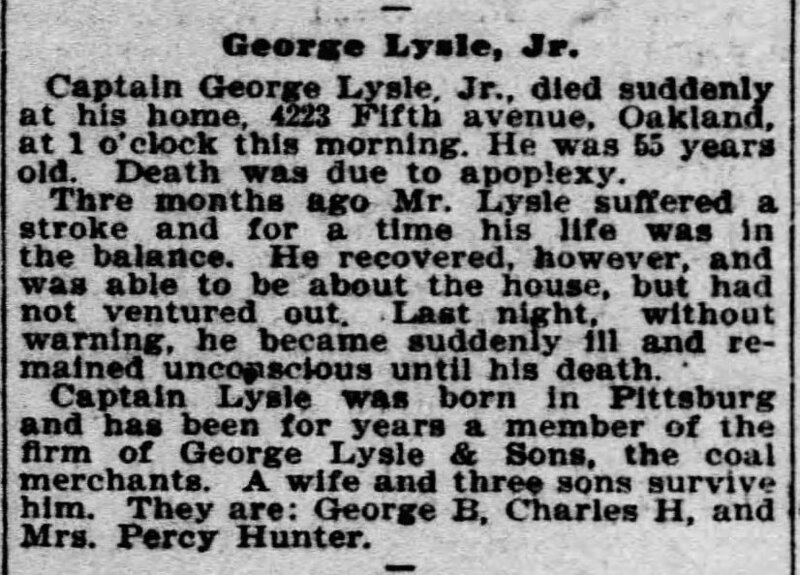 George Lysle, Jr. is buried in Uniondale Cemetery in what must be a large Lysle family plot. I don't know if he is located exactly next to his first wife Marion, but I hope so.